All SHI systems come equipped with flexible helium gas lines. Standard lengths range from 3 meters (10 feet) to 20 meters (66 feet), depending on the system. SICERA® Cryopumps come equipped with flexible helium gas lines in 25 meter (82 feet) lengths. 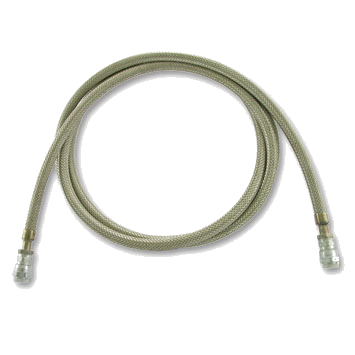 Gas lines terminate in coupling halves for quick connect and disconnect to and from the cold head and compressor. They are available with one end at 90°. All gas lines are pre-charged with clean helium gas. They offer a higher flexing cycle life than standard lines. Superflex lines also dampen vibration and noise of the helium gas traveling through the lines.